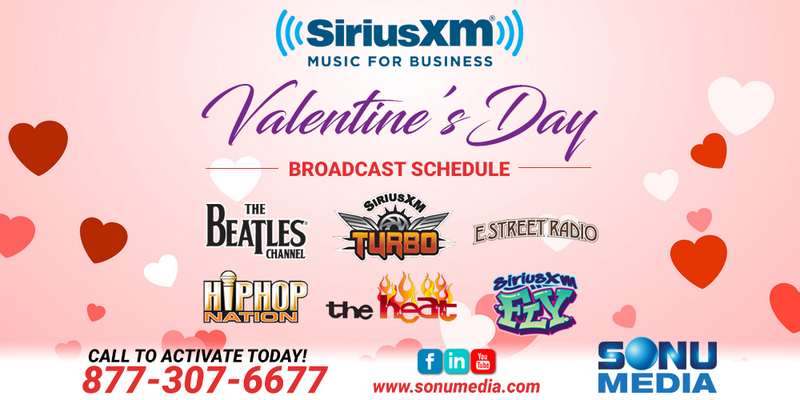 Valentine’s Day music on SiriusXM for Business is back! Tune-in to the list of Valentine’s Day Special Broadcast events below, and share the love with your associates and guests. Licensed love songs are the easiest way to set the mood for this couples holiday, and we have some really special and fun playlists to make it memorable for everyone. First and foremost, SiriusXM Valentine’s Radio will be airing on the Spotlight Channel (CH 4) through February 14th. The fan-favorite station promises an endless rotation of traditional love themed favorites, including songs like “I Will Always Love You” by Whitney Houston, “Mine” by Taylor Swift, “Just The Way You Are” by Billy Joel, and “All of Me” by John Legend. Tune in for a tasteful mix of love song smash hits across many different decades and genres. SiriusXM “The Beatles Channel” (CH 18) boasts both a very special Top 50 Love Songs Countdown, and an extremely rare hosting by none other than Peter Frampton. This exclusive playlist has been voted on by you! The listeners of The Beatles Channel have weighed-in on their absolute favorite tunes for the holiday, and it is sure to hit all the right notes for your intimate motif. Bruce Springsteen fans can spin the dial to SiriusXM “E-Street Radio” (CH 20) for another fan-curated playlist, featuring The Boss and more. Looking for that unique Americana sound to bring everyone closer together? E-Street Radio is the place to set up shop this Valentine’s Day. Need more edge and hard-rock in your Valentine’s Day? Swing over to SiriusXM Turbo (CH 41) to be truly metal! Join special hosts Brian “Head” Welch (KORN Guitarist) and his daughter Jennea for the Top 15 Hard Rock Duets of the 90s and 2000s. Headbangers with heart all day long. Spend your Valentine’s Day with Nikki Minaj for a special channel takeover on SiriusXM “Hip-Hop Nation” (CH 44). Let Nikki take you on an adventure through her favorite love themed Hip-Hop tracks, and give your holiday the bass it deserves! Khalid, singer of the smash hit R&B single “Location”, takes over SiriusXM “The Heat” (CH 46) for that down tempo rhythm Valentine’s Day begs for. Keep it smooth and sultry with this phenomenal hand-selected R&B playlist in your restaurant, bar, or venue. Tune-in to SiriusXM Fly (CH 47) for a special playlist featuring Toni Braxton. Toni promises to bring the best of her favorite tunes for your Valentine’s Day celebrations at 5:00pm EST.